The city also looks very pristine and could soothe the mind of the traveller due to its mesmerising effects. Lumbini : Lumbini, Lord Buddha's birthplace, adequately depicts many artistic arrangements of his birth, like the Maya Devi's statue in the temple with same name. 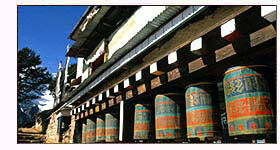 Lumbini is also picturesque and very quite place making it the heaven for the tourists. Sarnath : The four-lion statue, a splendid contribution by Ashoka that lies in this place has been adopted as the national emblem. There are many stupas built by Ashoka and temples, the prominent among them are Mulagandha Kuti Vihar, Choukhandi stupa, Ashok Pillar and Dhameka Stupa. 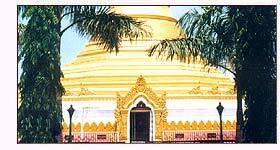 Kushinagar : One of the four must visits for the Buddhist pilgrims, according to Lord Buddha himself, Kushinagar is the place where Lord Buddha passed away. It was the centre of the Mallas dynasty who ruled over the place, however, only a little has remained in the ruins related to that period. The structures more prominently represent Ashoka's dynasty that had built many structures in this place of Buddha's death. Air : The best way to reach Kushinagar by air is through Bhairahwa and/or Kathmandu airport. Regular buses ply to Kapilvastu from Kathmandu. However Kapilvastu can also be reached through Varanasi (India), connected through many flights with all major cities of India. Rail : Siddhartha Nagar, at a distance of 20 km, is the nearest railhead, connected to major destinations in India. However, Gorakhpur could be the choice of most, being a well-known railway junction. Road : Good motorable road exists which connects Kapilvastu to major destinations in Nepal. Private buses and Taxis are available from all major cities like Varanasi and Lucknow in Uttar Pradesh. The best way to stay is in Buddhist charity foundations, like the Bharatiya Buddha Mahavihar, or the Sri Lankan temple Dharmashala. One can also stay at The Royal Retreat Heritage Hotel . Access : 14 Kms from Kapilavastu.